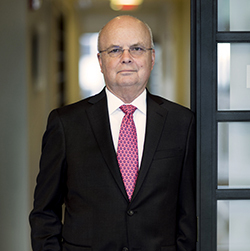 Pittsburgh native and former Director of the National Security Agency and Central Intelligence Agency, General Michael V. Hayden recently authored Playing to the Edge: American Intelligence in the Age of Terror, a book chronicling America's responses to new forms of terrorism, a major war and drastic technological advances in intelligence. The book offers insight into his time in the CIA, beginning in 1999, when he basically set the stage for the U.S. Government's policies for cyber security and a new age of espionage. Hayden says his recent tome is his "best effort to show to the American people what their intelligence services actually do on their behalf." The title was borrowed from sports terminology, referring to how a good athlete will take advantage of the entire field, right up to sideline markers and endlines. He acknowledges that espionage "often proves controversial, and I fear we will not be able to do that in the future without our public's deeper understanding of what American intelligence is and does." The New York Times calls Hayden a "proud product of blue-collar Pittsburgh," as his early education was received all within a 10-mile radius. Hayden played quarterback for St. Peter's Elementary (then coached by Dan Rooney) and graduated from North Catholic High School. Hayden earned both his bachelor's and master's degree from Duquesne's McAnulty College and Graduate School of Liberal Arts before undertaking a career in the Air Force and intelligence. Commissioned as an second lieutenant through ROTC in 1967, Hayden entered active military service in 1969 and rose to the rank of four-star general in 2005. In 2008, Hayden retired from the Air Force after 40 years of service and continued to serve as Director of the CIA until 2009. He is currently a principal at the Chertoff Group, a security consultancy co-founded by former Homeland Security Secretary Michael Chertoff, and serves as a Distinguished Visiting Professor at George Mason University's School of Public Policy. Hayden credits Duquesne for providing a broad base of knowledge and for helping him to hone his critical and analytical thinking skills. He received what he called "as close to a classical education as you get today." Hayden has said that "education at Duquesne compels us to see how things fit together, even when violence and world events seem to be pushing them apart." Hayden recently returned to Duquesne to take part in a speaking forum. Pulitzer Prize-winning journalist Joby Warrick, a national security reporter with The Washington Post, joined Hayden in the discussion. More than 450 people attended the event, which was hosted by Duquesne president-elect Ken Gormley. View archived video of the presentation here.